NASA's Kepler mission is searching for Earth-like planets by looking for them to cross the face of alien stars. MOFFETT FIELD, Calif. — Virtually all of the alien planet candidates discovered by NASA's Kepler space telescope may turn out to be the real deal, a new study suggests. Researchers announced today (Dec. 5) that Kepler has detected 2,326 potential alien worlds in its first 16 months of operation, including 48 in their stars' habitable zones — that just-right range of distances that could allow liquid water, and maybe even life, to exist. While the vast majority of these planets have yet to be confirmed, 99.9 percent or so may end up making the cut, according to the study. That would mean Kepler's finds to date would more than quadruple the number of known alien worlds, which currently stands at a little more than 700. This is Kepler's field of view superimposed on the night sky. Kepler needs to witness three transits to flag a potential alien planet. These candidates are then confirmed by follow-up observations, usually by large ground-based telescopes. Time on such big instruments is tough to come by; to date, about 30 of Kepler's 2,326 potential exoplanets have been confirmed. Most of the brightness dips Kepler detects are indeed caused by planets, researchers think. But there is a chance some candidates are false positives. For example, a dip could also be caused by an eclipsing binary, a second star that transits the one Kepler's staring at. In the new study, researchers led by Jean-Michel Desert of the Harvard-Smithsonian Center for Astrophysics in Cambridge, Mass., wanted to put a number on Kepler's false positive probability. So they examined a sample of 34 Kepler candidates using NASA's Spitzer space telescope, which is optimized to view in infrared light (Kepler looks in the visible spectrum). The team's 34 planet candidates spanned a wide range of sizes and orbital characteristics, Desert said. And Spitzer's observations showed that all of them are likely real alien planets. "We find an excellent match with what we measure with Kepler and what we measure with Spitzer," Desert said today in a presentation at the Kepler Science Conference here at NASA's Ames Research Center. The team's analyses suggest that Kepler's false-positive probability is lower than 1 percent, and perhaps as low as 0.1 percent, Desert added. That means that virtually all of the instrument's finds may eventually be confirmed. The new research is roughly consistent with a study performed earlier this year by a different group, which estimated Kepler's false-positive probability at less than 10 percent. For their part, Kepler scientists have repeatedly said that at least 80 percent of their candidates should end up graduating to become bona fide planets. 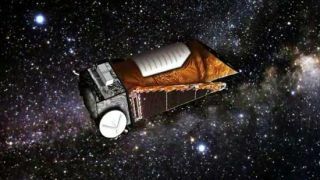 But the new study, and others like it, may motivate the Kepler team to revise that estimate. "We've probably been too conservative," Kepler analysis lead Jon Jenkins, of Ames and the SETI (Search for Extra-Terrestrial Intelligence) Institute, told SPACE.com.